This article is the first in a two-part series on Exercise Crocodile Strike. 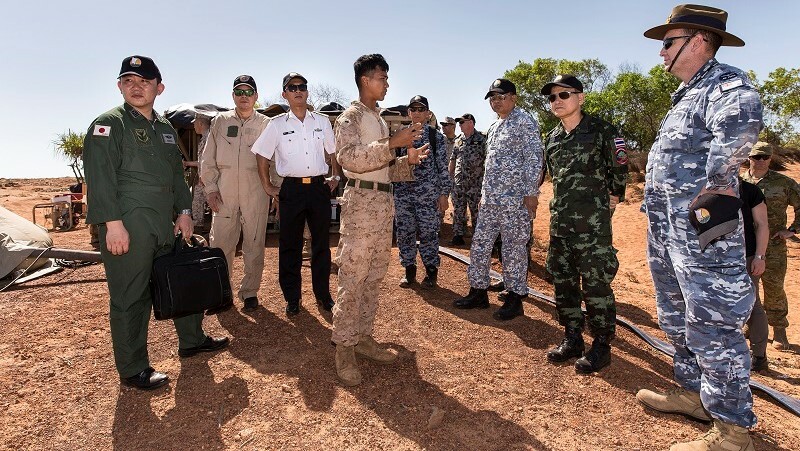 Last week I was given privileged access by Australia’s Department of Defence to join a small group of regional military observers (from Malaysia, Thailand, Vietnam and Japan) on Exercise Crocodile Strike, a joint drill between the ADF (Australian Defence Force) and the US Marine Rotational Force-Darwin (MRF-D). This offered a rare window on US Marine Corps (USMC) interactions with the ADF, the local community and international military observers. Part One of this series reflects on the exercise itself, Part Two focuses on the future of the Marine rotational force in Darwin. The ADF and US Marines already take part in Southern Jackaroo, a trilateral combat exercise with Japan. Crocodile Strike, which wraps up tomorrow, is the first of its kind to be themed around interoperability and cooperation in Humanitarian Assistance and Disaster Relief (HADR). The main 'field' element to this was delivery of community-based projects to Warruwi, a remote settlement on South Goulbourn Island in West Arnhem, 300 kilometres east of Darwin. Warruwi is a tight-knit, well-administered aboriginal community with a dry-season population of around 300. Infrastructure is in better shape than on many islands off the Top End. Community elders agreed to host the exercise because South Goulbourn Island was twice evacuated during cyclone season in 2015. Some locals also serve in the ADF, helping to smooth relations. Around 90 military personnel were deployed to the island for the exercise, drawn equally from USMC and the ADF’s 1 Brigade, including combat engineers, utilities specialists and a small medical team. Heavy equipment was sent in ahead by barge, while troops and observers flew in by RAAF C-130 and USMC tilt-rotor MV-22s. While we received a warm welcome to Warruwi, 'Crocodile Strike' is perhaps a questionable name for a drill designed to strengthen the resilience of local communities against natural disasters. Might I impertinently suggest 'Barramundi Assist' or 'Crocodile Stroke' for the next iteration? 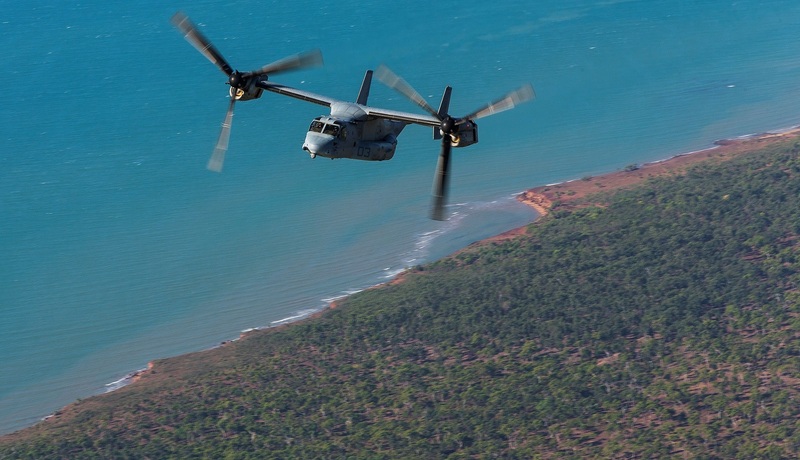 It was telling that the Marines kicked off the exercise with a long-range night raid against a fictitious Islamic State cell in the vicinity of RAAF Curtin, 900 kilometers west of Darwin. Now that MRF-D ('Murph-Dee') has brought along its own Air Combat Element, a 900-km operational radius will not go unnoticed among Indonesian military observers. They were invited to the exercise but did not attend. Indonesia’s Defence Minister Ryamizard Ryacudu was due in Darwin this week, for bilateral talks with Minister Marise Payne, including a briefing on Crocodile Strike. But his visit has unfortunately been postponed. Keeping Jakarta 'on side' with MRF-D is particularly important, given suspicions previously voiced within Indonesia about the nearby US military presence, notwithstanding its modest size. The curtain-raiser raid to Crocodile Strike provided the 'contested' environment, as demanded by the planning scenario. However, the subsequent HADR component of the exercise that I witnessed on South Goulbourn Island was conspicuously un-warlike. Small ADF and USMC teams were busy working together on construction tasks, mending fences and purifying water. None of the troops on the island bore weapons, including side-arms. For USMC, that’s unusual. Crocodile Strike did not obviously resemble a civilian-led HADR exercise either. Although described in terms of boosting 'inter-operability', I got the sense this was primarily about testing the respective comfort levels of the two militaries in less familiar territory than scripted combat exercises like Talisman Sabre and Southern Jackeroo. The military likes to talk about complexity in terms of 'crawl walk, run'. 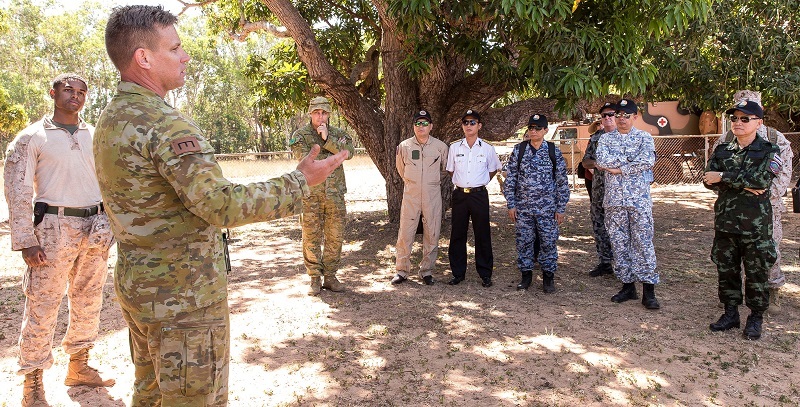 This exercise was in the crawl phase, but all the more interesting to observe because of the spontaneous interaction with a remote Northern Territory community, as well as that between the two militaries beyond the sterile confines of military training areas. The USMC and ADF operate well together, though they have their own distinct traditions and cultures that require some working through. Crocodile Strike could be considered a way station towards a future joint HADR deployment in Australia’s disaster-prone immediate region. HADR is not a core US Marine activity and was new to most of the soldiers I spoke to from MRF-D. But Okinawa-based Marines were integral to the US response to Typhoon Haiyan, in the Philippines in November 2013, and Japan’s 'triple disaster' back in March 2011. In fact, the logistical effort required for HADR delivery overlaps to a surprising degree that of expeditionary operations. Hence there is a general training value, to both USMC and ADF, out of such exercises as Crocodile Strike. Moreover, the US Marines have a long tradition of 'civic action' operations, in Southeast Asia and elsewhere. The institutional memory of this faded during the USMC’s prolonged post-9/11 combat deployments to Iraq and Afghanistan, although civil activities were practiced there too. The same might be said for the Marine Corps’ amphibious roles and missions, which are now being brought back to the fore in a maritime-oriented Pacific context. For its part, the Australian Army has also been re-mastering an amphibious capability in recent years. Unsurprisingly, for a top-down initiative that came about in order to provide some local heft to President Obama’s announcement of the US 'pivot' to Asia, on his visit to Australia in November 2011, the Marine rotational force in Darwin has struggled to find an obvious mission. Now into its sixth rotation, the MRF-D strength is currently around 1250, well below the 2,500 troops and full Marine Air Ground Task Force (MAGTF) originally envisaged. Negotiations between Australia and the US on co-funding the enabling infrastructure were prolonged and at times painful. But the key support elements to MRF-D over its 25-year lifespan have now been agreed, as part of the wider Force Posture Initiative, which additionally comprises an Enhanced Air Cooperation strand. The re-location of the ADF’s Armoured Regiment to South Australia has opened up significant space in Darwin’s Robertson Barracks, including vehicle storage – essential during the rainy season. The Marines will have substantial room for expansion in future. New construction at Robertson is scheduled to take place within the 2022-25 timeframe. Interestingly, Australia’s strict quarantine requirements mean that USMC military vehicles and helicopters have to be stripped down and cleaned in order to comply with entry requirements (the same stringent regulations apply to ADF equipment returning from overseas). This adds a significant cost in time and labour. Hence the USMC’s decision to retain 137 vehicles and a skeleton staff, at Robertson Barracks, in between rotations. 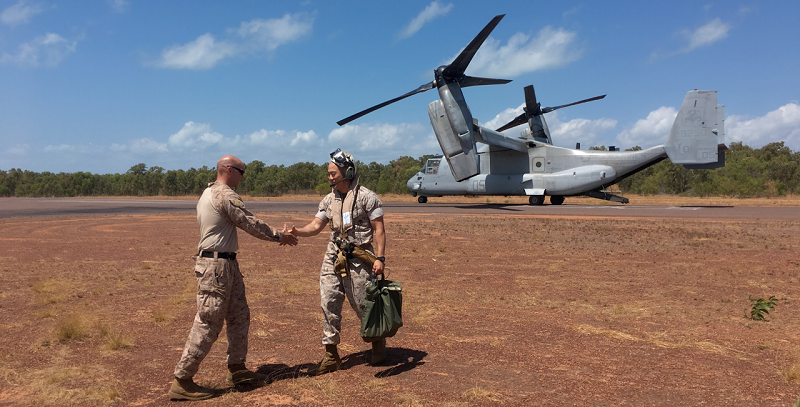 There is a significant overhead attached to operating out of Darwin (US$23 million per rotation was one figure I heard), so the USMC hierarchy naturally wants to maximise the training value and access to the region. As well as offering access to several 'nearby' ADF training areas, including the sprawling Bradshaw field site, Darwin has obvious locational advantages as a tropical springboard into parts of maritime Southeast Asia and Melanesia. The Marines already train together regularly with French forces out of New Caledonia, and mount an annual afloat exercise, Koa Moana, in September, to Timor Leste, PNG, Fiji and Tonga.